Koh Surin National Park is a paradise of fine white sandy beaches, thick jungle, crystal-clear waters, and the most extensive coral reef in Thailand. It is also home of the Moken Sea Nomads. The park is the ideal place to go for people wanting to connect with nature in its most beautiful and pristine form, escaping traditional touristy beaches with their bars, noise, and crowds. Andaman Discoveries can offer information and book your Koh Surin trip, offering both private and join with a group tours. Please contact us for more information. 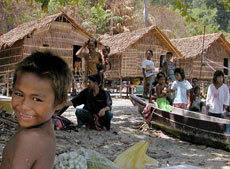 Andaman Discoveries is proud to offer an award winning, unique, private tour lead by the indigenous Moken people. After arriving to islands, you will leave the crowds behind and immerse in the life on the Surin islands with its original inhabitants. During your days on the islands you will be accompanied by a Moken local guide and Andaman Discoveries translator. Travel around the islands in a Moken longtail boat, have a private tour of the village, homes and natural trail, and snorkel away from the crowds. Underwater you can witness the impressive swimming and diving skills for which the Moken are renowned, as your local guide points out colorful fish and corals. All meals and accommodation must be had at the national park headquarters. Alternatively, you can join with a group on the speedboat and have free time in the evenings in your tent accommodations. 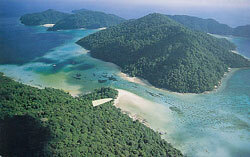 We can help you arrange your trip to Mu Koh Surin National Park, just contact us. One advantage of Koh Surin is that you don’t need to SCUBA dive to discover some of Thailand’s most extensive marine diversity. The shallow reefs are perfect for snorkeling and bursting with vibrant fish and colorful corals, even for those who aren’t confident in the water. If you’re lucky, you may even see turtles and whales in the area. 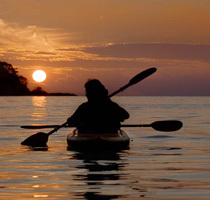 The National Park offers two snorkeling trips a day, or you can hire your own long-tail boat. A short boat ride away is Richelieu Rock and Burma Banks, world-class SCUBA destinations for enthusiasts who like to go deeper. The National Park has two sites: the headquarters and Hat Mai Ngam, both offering beachfront camping, a restaurant, and shower facilities. The headquarter site also has rooms available to rent. The National Park has quality tents for rent (small and large) but you can also use your own and pay a fee per person. Hat Mai Ngam is a larger site with larger beach. The restaurants offer Thai food three times a day, which you have to buy coupons for. Food is fine and only slightly more expensive than on the mainland. You can sign up in the morning for a set menu, which always includes lots of fresh seafood. There is a two-kilometer coastal nature trail connecting the two camp sites which takes about two hours to walk. Ask us for our Hat Mai Ngam nature trail information sheet, highlighting points of interest along the trail. The Moken Sea Nomads are an ancient nomadic sea people who have lived between the Mergui archipelago of Burma and the islands of Thailand’s North Andaman coast for thousands of years. Traditionally nomadic, they would spend most of their time out at sea and moored in sheltered locations during the monsoon season. 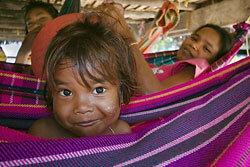 In recent years, the Moken have been encouraged to settle to gain Thai citizenship. 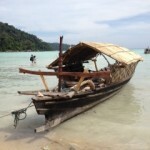 They are now located in a village called Bon Bay on Koh Surin Tai. You’ll see their spirit poles as you arrive, watching out over the sea. The Moken are hunters and gatherers and live in harmony with nature. They have a great knowledge and respect for nature, and worship the spirits of the Earth. They rely upon their environment for food, shelter, and for the materials used for making their traditional kabang sailing houseboats. Their traditional way of life and culture is under threat in many ways, meaning they are no longer able to live purely from the land and from the ocean. Many have to seek employment to earn money to be able to live, which isn’t easy when you have no citizenship, no rights, and suffer from discrimination. The plight of the Moken is a complicated one and highlights the issues surrounding traditional culture and an ever-encroaching developed world. The Moken do not have a written language, but are good at other languages including Thai and Yawi Malaysian. Their history is retained within oral folklore, passed down from generation to generation. Every April, during the Lobong festival, the Moken worship their ancestors and ask the spirits to take care and protect them. You are encouraged to visit the Moken, but there is a better way of doing this than simply arriving, walking round the village, and staring at people as they go about their daily lives (which is what normally happens). There are few economic opportunities for the Moken, so if you can, rent a Moken long-tail boat to visit the island. An easy way to contribute is to purchase their hand-woven pandanus leaf mats and bracelets or their intricate model kabang boats. Don’t be tight and haggle — they are very cheap already. With the people that you see, make eye contact and smile, as you are a guest in their village, not in a museum. 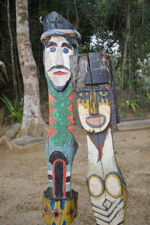 Also ask about the Chok Madah Nature/Culture Trail in the Interpretive Center at the Moken village, Large Bon Bay. This is an educational trek across the island highlighting Moken ethno botany, which describes many of the plants traditionally used by the Moken for everything from medicine and food to tools and boat building. A Moken guide will take you round the trail and the village, highlighting points of interest; you’ll be amazed at their local wisdom. Andaman Discoveries can provide a booklet to accompany this trail, so let us know if you would like a copy before you leave. Hiring a Moken guide also encourages the tribe to embrace and take pride in their fading culture. Don’t give money or modern sweets directly to the children, as they will start to expect it from all visitors and develop a sweet tooth. If you want to make a donation, fresh fruit, vegetables, and rice is much more useful. The hot season starts from mid February through to May, while the wet season starts from mid May to October. 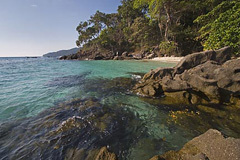 Mu Koh Surin National Park closes from April 30th until November 1st during the wet season. Mu Koh Surin National Park is located 60 kilometers from the coast of Phang Nga province and includes five main islands: Koh Surin Nua, Koh Surin Tai, Koh Ree (or Koh Satok), Koh Glang (or Koh Pachumba) and Koh Khai (or Koh Torinla). Koh Surin Nua and Koh Surin Tai are large islands and are situated on a north-south axis. A few kilometers to the north of the park are the Myanmar border and about 100 kilometers to the south is Mu Koh Similan National Park. 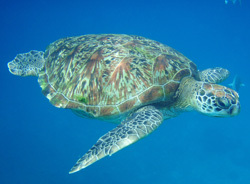 Sea turtles are a common sight while snorkeling. Many species are endangered with several species near extinction. Their principle threat is the loss of their nesting beaches to development stimulated by increasing tourist pressure. This has reduced the number of turtles worldwide to such an extent that positive action must be taken to secure their existence in the future. The principle action is the preservation of their nesting beaches, and the protection of the eggs from theft once laid. Sea turtle still nest on the Surin islands, with two species coming ashore to lay their eggs: Hawksbill and Green turtles. If you are lucky enough to see one, please do not feed or touch them. You are not allowed on some beaches — this is for a good reason, so please respect this. People walking on the sand damage eggs. Please, please, please do not touch any marine life or corals while you are snorkeling. Coral is very delicate and easily broken, taking years to re-grow. Try to maintain your buoyancy to avoid damaging the reef. Wearing a lifejacket can help. Be very aware of your fins, as you may be hitting coral without actually feeling anything. Take your litter home with you and don’t remove any shells or coral. Remember, take only pictures, leave only footprints! It’s important we all do our bit to avoid damaging this paradise.